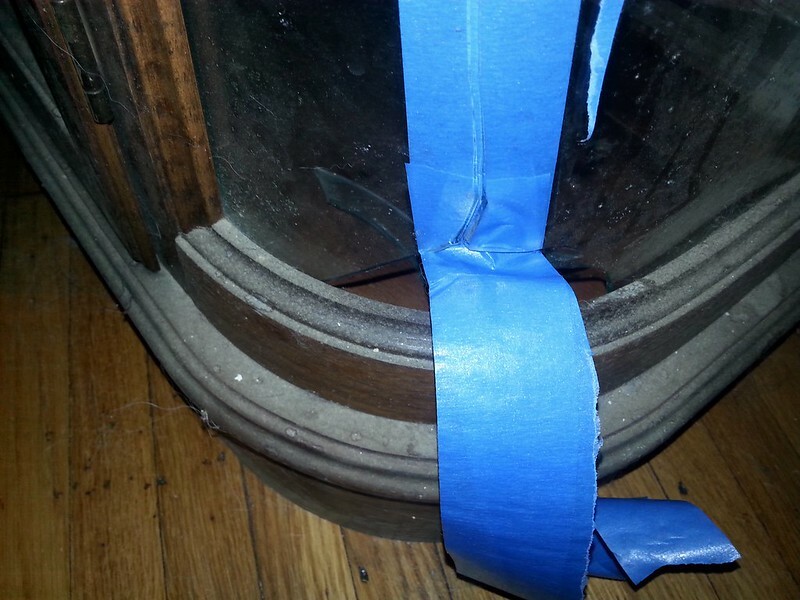 Can you help with ideas for fixing a broken display cabinet? Mods, if this isn't in the right place, please feel free to move. Thanks! Below are pics of a small vintage display cabinet with a broken glass panel - please excuse the layer of grossness on it, it's been in our building's basement uncovered for a few years! Needs a deep clean. Also, this post is a bit longish, but I wanted to provide all the background I could. Thanks in advance for anyone taking the time to read and ponder and offer ideas! I'm hoping to tap into the collective creativity of this group, folks who are used to modifying stuff using creative approaches and applying oddball materials to create something of beauty. Anyway - the sides have curved glass panels - I think they DO come out, so I could maybe take the pieces in and get a quote on a new piece of glass. However, I think getting custom curved glass might be pricey, so I'm looking for an 'in the meantime' fix that makes it safe to use and stabilizes the break. I'm fine with a visible fix - it doesn't have to look like glass even. I like the Japanese philosophy of 'kintsugi' repair, where the fix becomes part of the history of an object and not something to be disguised. Once this cabinet is cleaned, I plan to apply a 'shabby chic' type of distressed paint effect, probably in a white or cream color chalk paint. Think French country farmhouse as the overall look I'm aiming for…then it will become housing for some creative dollie art pieces, I think. It also lights up from inside the top, and has a glass shelf inside. 1) Taking the glass out entirely and replacing it with either chicken wire (but that allows dust in) or some chicken wire lined with linen or burlap concoction. 2) Using the glass, but applying some type of decorative paper or whatever that stabilizes the crack, maybe with tape to hold the glass and then Mod Podging decorative paper over it. Or a self-adhesive paper. 3) Using air-curing clay (like paper clay?) that I can work into the crack and the hole at the bottom, and then either paint it (so it actually could look like a kintsugi fix, usually they've got gold leaf added to the fixative), or even add some texture to the outside of the paper clay. The cabinet also has an interesting story, if anyone wants to know I'll include it in another post. This one was getting long! Thanks again for any and all ideas!! 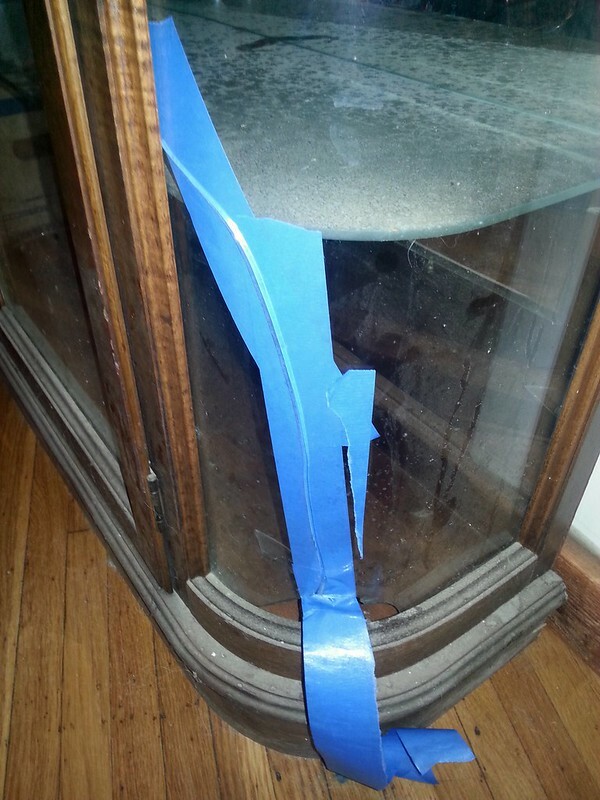 Re: Can you help with ideas for fixing a broken display cabinet? Whew, I wouldn't be surprised if a replacement glass panel ends up being pretty pricey. I kinda like what you've started up with your tape, myself. Have you considered getting a few different colors of tape and cutting them up and overlaying them to make a pattern of crisscrossing vines and flowers or something? You could do it on both sides of the glass and add a neat 3D effect with the little bit of depth that the thickness of the glass would give you. Plus, doing the mend on both sides would strengthen it overall. You could even add details or rosemaling in your paint job to echo the design. One thing I remember was a small window that a had a crack. they had repaired with buttons and "sewed" buttons to hold it in place. I found this quite fascinating with the crack buttoned up. We did not have much money either so it stayed that way for a couple years until the glass was replaced. I don't remember exactly how it was done but I wonder if there are other fixes out there. Anyway I wonder if you put buttons similar sized on each side of the crack. Then slidiing fine wire thru the holes thru the crack. Back and forth like sewing it would hold the two pieces together. You could do the buttons in various colours or styles to "dress the crack up". I tried to do a quick search online and windows and buttons bring up only modern technology. So .... I have an appt so got to run but I will look again. Also I will call my mom and ask her if this has a name and how to do it. She is a lover of kitisugi, so will know something. Also why not at least get a quote for replacing because sometimes the coat may be reasonable. Am out and will reply later, but if you google 'antique make-do' you'll find similar 'creative' fixes. Some people collect them. Thanks girlnamedlance! I especially like the idea of painting on the glass or vinyl. I think this project might be coming up in the next couple weeks. Thanks everyone for your suggestions! Ill be sure to post a pic of the cabinet before/after. Thanks for sharing this! I may or may not have spent a ridiculous time googling 'kintsugi' and am now thoroughly fascinated. You might (or might not, lol) also be interested in googling 'antique make-dos' (or some spelling variation thereof)…those are from 'olden days' when folks actually had things repaired rather than throw them out. I'm talking china and metal pans, that sort of thing. People actually collect them. Some of them are quite beautiful. My grandma has a cabinet that looks a lot like that, and it's so beautiful. Hers was broken like that a couple years ago, and replacement glass is very pricey. Ended up getting plexiglas as a replacement, which was a third of the cost and it's impossible to tell the difference between the glass and the plexiglas. Hope you can fix your beautiful display case! Bring me home in a blinding dream through the secrets that I have seen. Wash the sorrow from off my skin, show me how to be whole again. I'm only a crack, in this castle of glass. Hardly anything there for you to see. Thanks Lions! Did your grandma get a curved piece of plexi, or a thinner piece that bends? Hope you can find a suitable solution for your lovely cabinet! If you're still looking for ideas, and I'm not sure how plausible or possible this is, but if you're interested in kintsugi, maybe you could use some kind of shiny gold "putty" or something along the cracks in the glass? Or putty with gold paint over it? Just a thought. Thanks danbo! I was JUST thinking this morning about the stuff I've seen mentioned here on the forum (Epoxy Sculpt? ), and wondering if that might work. Need to check to see if it's useable with glass. I'd previously bought some paper clay, as an air-cured filler option, but seems the epoxy stuff might be stronger? I also want to add some texture, and have recently tried some textures out in my pottery class that might be nice. So with all the good ideas shared here that offered many options and have my brain percolating, seems its coming together. Some gold/kintsugi or even a silver of some kind might be good. UPDATE: Broken display cabinet - Apoxie Sculpt vs Miliput? Many thanks to everyone who's chimed in with ideas for fixing my display cabinet! I'm getting ready to deep clean it and then do the repair, and have narrowed it down to two products: Apoxie Sculpt or Miliput. I've done some research: they both air-cure and dry hard, both have good working time, both not super-toxic. Apoxie Sculpt adheres to glass, not sure yet about Miliput. Miliput appears to be cheaper. However I've seen some reviewers saying one is better than the other and vice versa. So I'm hoping for any additional thoughts before I purchase. I envision using it IN the crack, with some overlap on each side of the crack, both on inside and outside of the cabinet, so once hardened it hopefully seals/stabilizes the crack edges. As for finishing: maybe smoothed inside or just a light texture to hide fingerprints. Outside I plan to sculpt and texture and make it look really organic and natural, maybe even make it look 'laced' (like a corset), holding the two sides together. As for paint: gold or silver leaf, or some shimmer, would be nice. Like it's a tear in the Quantum Fabric. Celebrate the fix, not trying to hide it.